Editor’s note: On Jan. 9, 2018, U.S. District Judge William Alsup ruled that DACA must stay in place while cases against the rescission wind through the courts. The program no longer accepts new applications from Dreamers without DACA status. For a short time, soccer seemed like it might be Daniela Benitez’s ticket to attending college. She didn’t begin playing soccer until the eighth grade, but by her junior year of high school, she had the attention of a college recruiter. There was a catch, though. “I was going to get scouted, but I didn’t have a social (security number),” Benitez told me recently. Raised in Phoenix, Arizona, Benitez came to the United States illegally from Mexico when she was just eleven months old. She couldn’t receive any state or federally funded scholarships, including soccer scholarships, or the prestigious Obama Scholarship she’d won. She also did not qualify for in-state college tuition, and her family could not afford out-of-state tuition. By her senior year of high school, Benitez began to understand why her parents, who also are undocumented, had never pushed her academically. “(My mom) didn’t pressure me for a reason,” Benitez said. “She didn’t want to get my hopes up, and now I see why.” Now 18 and a year out of high school, Benitez is waiting for her Deferred Action for Childhood Arrivals, or DACA, paperwork to go through. With DACA status, Benitez would be able to attend college, drive and work without fear of deportation. She also would qualify for in-state tuition in Arizona. A protester marching in Los Angeles following the Trump administration’s efforts to end the DACA program. 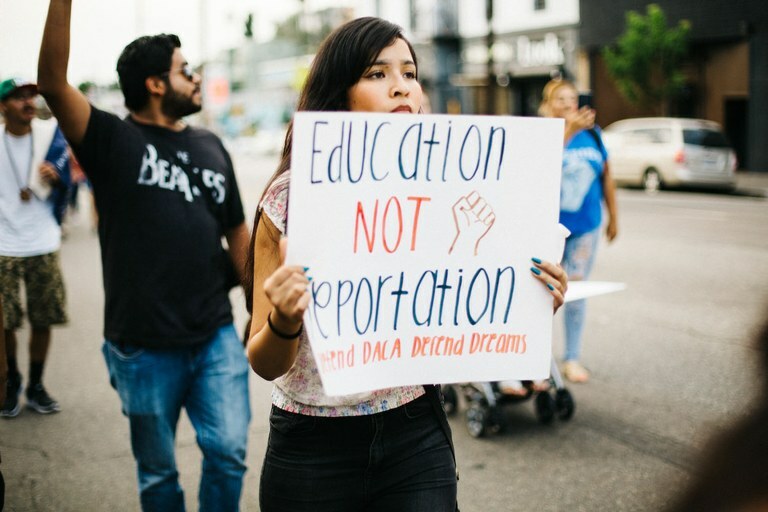 For undocumented migrants brought to the United States as children, their legal status can be a barrier to accessing college. But the status of DACA itself may be in jeopardy, and the future of young people like Benitez is being kicked about like one of her soccer balls. On Sept. 5, the Department of Homeland Security rescinded the DACA program, citing executive overreach. President Donald Trump says one goal was to pressure Congress to pass immigration reform legislatively. In January, a federal judge blocked that decision, pending litigation by a coalition of state and local governments, individual Dreamers, and the University of California. In response, the Justice Department appealed the judge’s finding to the 9th Circuit Court of Appeals. It also asked the Supreme Court to review the judge’s finding. Meanwhile, Congress has yet to pass permanent DACA legislation. Created by the Obama administration in 2012, DACA, or the Deferred Action for Childhood Arrivals program, allows some people brought as children to the United States without documentation to live and work in the country for two years without fear of deportation. DACA does not offer a path to U.S. citizenship. 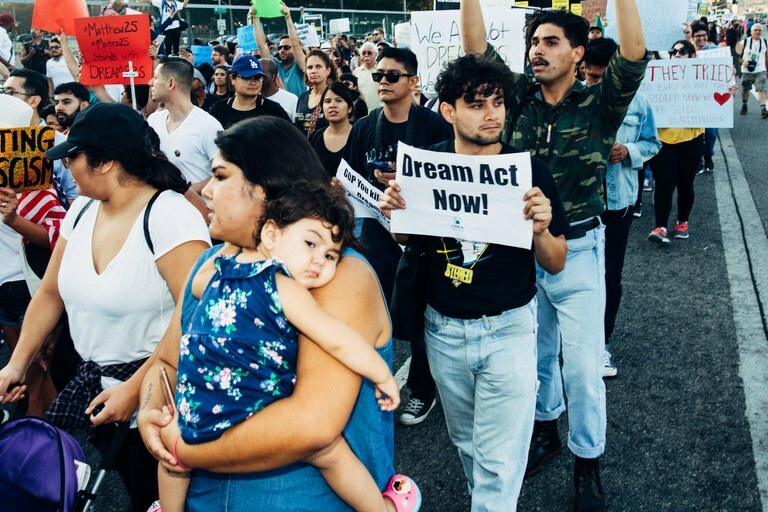 When then-Homeland Security Secretary Janet Napolitano signed the DACA program memo, Congress was struggling to pass the Dream Act, a bipartisan effort at immigration reform that would have given Dreamers a path to citizenship. Congress has tried repeatedly and failed to pass the legislation since 2001. Different organizations use the term Dreamer differently — some define Dreamers solely as those who have DACA status. Many within the immigrant community identify Dreamers as all people who are eligible for DACA. By that broader definition, while approximately 11 million undocumented migrants live in the United States, only about 12 percent —1.3 million — are Dreamers, or people who qualify for protection from deportation under DACA. Of that number, about 700,000 people were enrolled in DACA as of September 2017, when the Trump administration rescinded the program. DACA recipients were born no earlier than June 15, 1981. They moved to the United States before turning 16, and have lived in the country continuously for the past decade. They must be students, honorably discharged former military members, or have a high school diploma or GED. They must not have a felony conviction and must be able to pass a public safety screening. It costs $495 to apply for DACA, an amount that some Dreamers find prohibitive. Many Dreamers, including Benitez, emphasize that America is home for them, an idea that the numbers bear out. According to the Brookings Institute, when DACA began, most applicants came to the country as young children. In the program’s first seven months, two-thirds of DACA applicants were 10 years old or younger when they arrived, and one-third was under the age of six. Today, approximately 20 percent of DACA recipients are high schoolers. 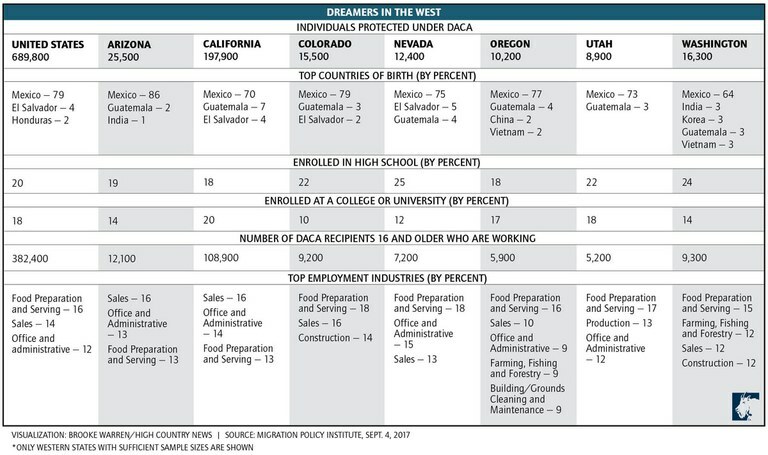 According to the Migration Policy Institute, DACA recipients are much less likely than their undocumented peers to work in construction jobs and are more likely to work in office support jobs, suggesting that the program leads to economic mobility. They most commonly work in hospitality, retail trade, construction, education, health and social services, and professional services. They account for one-quarter of one percent of all U.S. workers. What did the Department of Homeland Security memo change? On Sept. 5, 2017, acting Secretary of Homeland Security Elaine Duke released a memo rescinding the DACA program. In a statement released the same day, Trump called DACA “executive amnesty.” On the campaign trail, Trump had promised to build a wall between the United States and Mexico. He also called undocumented Mexicans “rapists” and “criminals.” Now, he blamed DACA for a “massive surge” of unaccompanied minors from Central America, whom he linked to gang violence in the United States. In fact, the Chicago Tribune points out that most unaccompanied minors from Central America left because of crime and lack of opportunity at home, not because of knowledge of DACA. After Sept. 5, the U.S. Citizenship and Immigration Services stopped accepting new DACA applications, and Dreamers with expiring permits had one month to reapply. But many were unable to meet the Oct. 5 deadline, especially after hurricanes Harvey, Irma, and Maria caused widespread destruction in regions with large immigrant populations, prompting 36 members of Congress to request in a letter to acting Secretary Duke that she extend the deadline. Duke did not. In September, an estimated 21,000 to 22,000 recipients who hadn't renewed began losing their status. Dreamers who had renewed their DACA enrollment would begin losing their status on March 6, with no enrollees left after March 2020. In addition to fears of deportation, the loss of DACA status leads to more immediate problems: job loss and loss of in-state tuition rates. U.S. District Judge William Alsup temporarily blocked Trump’s DACA suspension earlier this month, pending ongoing legal action against the Department of Homeland Security. The president of the University of California system, Janet Napolitano, is a plaintiff in a lawsuit against the rescission. She also is the former governor of Arizona, and was the Secretary of Homeland Security who signed the directive creating DACA. The Department of Justice is fighting Alsup’s block, both by appealing his stay and, in an unusual move, seeking a direct review of his stay by the Supreme Court. Benitez, who now volunteers for an organization that helps DACA-eligible individuals register for the program, says people are scrambling to turn in their paperwork before this unexpected window slams shut once more. Protesters marched in Los Angeles in September after the Department of Homeland Security announced that the DACA program was ending. Lawmakers on both sides of the aisle continue to work for immigration reform, including more permanent protection for Dreamers. Some, such as Sen. Jeff Flake, R-Ariz., hope to pass bipartisan, compromise legislation soon. Yet the president’s statements and actions complicate these efforts. “I think that transcends into the picture that he’s trying to paint of America that we’re under assault and therefore this is one way that we’re going to protect America for Americans,” says Rep. Raúl Grijalva, D-Ariz. “And then all the dog whistles associated without a doubt make it a race issue.” Indeed, during a closed-door meeting last week to discuss the bipartisan legislation that Flake and others are working on, Trump reportedly asked, in reference to Haiti, El Salvador and African countries, “Why are we having all these people from shithole countries come here?” He then reportedly suggested that the U.S. should bring in more immigrants from countries such as Norway. Meanwhile, Grijalva and others are still pushing for a “clean” Dream Act. A clean Dream Act doesn’t bargain for the fate of Dreamers by combining longterm Dreamer legislation with other immigration reforms, such as border wall funding or further immigration restrictions. Those issues, Grijalva says, should be addressed through a separate comprehensive immigration reform package. According to Grijalva, the one bargaining chip that Democrats have to get a clean Dream Act passed is a looming spending bill deadline: Friday, Jan. 19. The party could hold up the spending bill in order to force action on the Dream Act in some form. But whether Democrats have the will to make a potentially unpopular move in a midterm election year has yet to be seen. In any case, the Republican-held Congress has made moves in recent days to pass a stopgap spending bill to fund the government through February, perhaps buying time for further negotiations.